In Part 1, I reviewed research literature on the relationship of inverse ground contact time, 1/tc, to the metabolic cost of running. Further, because the leg stores and reuses elastic energy, spring mass models have been used quite extensively since the 1960's to describe it's spring characteristics. 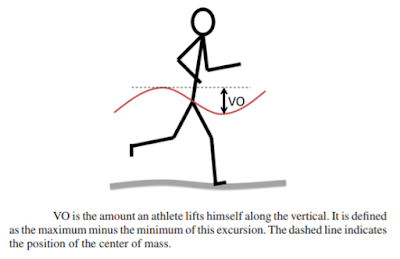 In this installment, I will investigate the relationships between leg spring characteristics against variable step frequency and variable ground contact time in two tests. I will use two wearable electronics - a Polar V800 and a Stryd gen 2 footpod - along with a treadmill and an Android phone. Force plates, kinematic arms or 3D motion capture systems were not used. A point to note is that the human leg is not a pure linear spring due to various muscoskeletal complexities, therefore the estimated stiffness variables will be preceded with the word "effective" in this writeup while device native metrics are called as is. Lastly, as the test was done on myself, there could be an effect of human error and testing inexperience shown in this study. When possible, I've tried to introduce randomization in the test protocol to equalize the effect of external factors not accounted for in the experimental design. You are free to mail me pointing out any flaws in understanding. Commentary to the findings (or the "intelligence") is highlighted in blue. Read Part 1. Or ask. 1. 5 min warmup at 2.8 m/s pace. 2. 2 min run at 3.3 m/s pace to determine fcSF. 3. Calculate 6 test SF values from 30% reduction to 30% increase in 10% increments : 0.7fcSF, 0.8fcSF, 0.9fcSF, +1.1fcSF, +1.2fcSF, +1.3fcSF. 4. Part A (Variable GCT - Variable SF test) : Randomize the order of the above and complete 6 trials of 2 min each at 3.33 m/s. 2 min recovery in between. 5. Practice a running motion for self-imposing short GCT and long GCT. 6. Part B (Variable GCT - Fixed SF test) : Complete 2 x 3 min randomized trials strictly at fcSF and at a pace of 3.33 m/s, one with short GCT and one with long GCT. 7. Consolidate data for post processing within a statistical computer package. Note : 3.33 m/s corresponds to 12 kph on the treadmill and 8 min/mile. A cadence of 180 SPM corresponds to 3 Hz. The fcSF during the initial 2 min trial run was 177 SPM which is 2.95 Hz. Corresponding GCT was 235.5 ms.
LSS at fcSF = 10.2 kN/m. 626 data points were consolidated from this test. Fig.1 ; Spread in data for Part A for each of the 6 SFs. 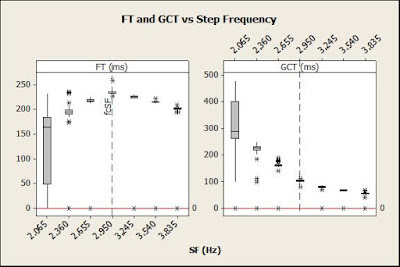 FIG 1 : Box plots of FT and GCT at the 6 different SF's are shown relative to fcSF (marked with a dotted reference line). SF-30% has a large spread because I had difficulty trying to main such a low cadence, having to hold the sides of the treadmill for support at times. This plot has been made after cleaning up a lot of null values within the SF-30% dataset. Inspite of this, there still is great spread relative to data at other SFs. The general takeaway is that ground contact times fall steadily with increase in step rate and rises with decrease in step rate. One would expect aerial times to be high in the low cadence region, but the data seems to show an inflection point at fcSF of 2.95Hz. In the increasing cadence region, FT tends to decrease. the variable GCT - variable SF test. FIGS 2 & 3 : Decreasing changes in GCT obtained from the variable SF test correspond to positive changes in LSS. A simple linear regression shows R^2 value is 0.79. The Pearson correlation test of both yields -0.889 (P < 0.05). Problematic, however, is the fit of SF variation with LSS. Some of the noise in the left hand side is most likely due to the improperly executed low cadence test at SF-30%. If you consider just the right hand side of Fig 3, there seems to be a +ve to +ve relationship between higher SFs (SF10%, SF20% ,SF30% ) and LSS. The Pearson correlation between SF and LSS yields -0.421 (P < 0.05). Takeaway here is that GCT maybe a better predictor of LSS. Test Part B will prove if this is correct. The short GCT was obtained by conscious fore foot landing close to vertical line passing through COM and quick leg swings. The long GCT resulted from an exaggerated rolling motion of the feet, almost to the point of heel first first landing. Point of contact was farther away from the vertical line passing through COM. 326 datapoints were consolidated from this test. Plots of data are presented below. the variable GCT - fixed SF test. Fig 4 : Almost 96% of the variation in LSS was explained by variation in GCT. Further, the Pearson correlation between variable GCT and variable LSS was 0.98 (P < 0.05). The plot shows that variations in GCT in a variable GCT test - fixed SF test are more strongly related to LSS than in a variable GCT - variable SF test. This plot shows the LSS - SF relationship for both tests A and B making it clear the stronger regression in Test B (orange markers). Fig 5. Scatter plot showing peak nGRF expressed as N/kg with % variation in SF. Fig 5 : An expression for GRF was obtained from sinusoidal approximations given in Blum et.al and verified with an older paper by Morin et. al. Using temporal variables measured by Stryd, the calculated GRF was then normalized by my body weight. This is shown in Fig.5. SF20%. and SF30%. Above the preferred step frequency, peak ground force decreases. This finding agrees with literature. The behavior at lower SFs could be a product of high COM elevation or aerial time. It tends to agree with certain reality that drastically reducing cadence at the same high running speed makes loud landing sounds in the gym. High force = high loading = high noise! This observation points to a flaw in the finding in Fig 1 that aerial time reduces with decreasing step frequency, infact I believe it should be the opposite. Having seen in Part 1 that metabolic cost is directly linked to the inverse of GCT, it's interesting to inspect the behavior of this variable from the variable SF test data from Part A. Fig 6. Scatter plot showing rate of force production vs % change in SF. Fig 6 : There seems to be a distinct bow to the shape of this curve corresponding to the line of fcSF. Below and above this line at SF-30% ,SF-20% ,SF-10% ,SF10% ,SF20% & SF30% , inverse GCT shows increase. While data is limited to 626 samples and there is still some noisy data at the extreme low cadence, this graph generally agrees with literature. The surrogate data here suggests that there is a global minimum in metabolic cost at my freely chosen cadence of 177 SPM at 3.33 m/s pace. Intuitively, faster cadence means lesser GCTs. Muscle firing must be fast to produce ground force. Faster muscle firing has an oxygen penalty. Lesser cadence than preferred cadence at the same running speed also doesn't look optimal, as leg loading increases (Fig 5). One of Stryd's developers told me recently that they had not decided to release the math used to calculate leg spring stiffness (LSS) just yet. Curious as I am, I investigated how my own estimated values of ELS and Δy(COM) compare with Stryd's LSS and VO. EVS is the ratio of peak GRF and the vertical change in COM. ELS is the ratio of peak GRF and change in resting leg length. Both can be estimated from temporal variables and some high school math. Fig 7. Scatter plot showing change in Stryd reported LSS and estimated VO with % change in SF. Fig 7 : For lack of a metric to compare Stryd's LSS, I plotted it against the measured VO. The data suggests there's a curvilinear relation in both the variables with variable SF. LSS appears convex shaped against SF. The lowest VO corresponds to the highest SF's (and vice versa) whereas in leg spring stiffness, there appears to be a global minima between fcSF and SF10%. The takeaway is that oscillation of a fixed point on my COM decreases with increasing step frequency. This agrees with the decreasing trend of FT and GCT at high SF's from Fig 1. Spring stiffness also increases with step frequencies. Both these findings tend to agree with literature. Fig 8. Scatter plot showing change in estimated EVS and estimated Δy(COM) with % change in SF. Fig 8 : The change in estimated EVS is convex shaped with % change in SF whereas that of Δy(COM) is concave shaped. The data seems to suggest that global minima in EVS is somewhere between fcSF and SF10% and much higher in both directions from this point. Global minima in Δy(COM) is closer to the highest SFs and maxima is clustered around the lowest SFs. The magnitude of estimated EVS seems smaller than I expected compared against literature reported values. The estimated value of vertical stiffness agrees with Stryd's LSS trend (Fig. 7) - both are convex shaped in SF and there appears to be a global minima between preferred cadence and SF10%. Fig 9. Scatter plot showing change in estimated ELS and estimated ΔL with % change in SF. Note that ELS calculation corrects for the translation in point of foot contact, therefore it is a POFT corrected spring stiffness, yielding higher magnitudes than those calculated without POFT correction. The change in estimated ELS is convex shaped with % change in SF whereas that of ΔL is concave shaped. The data seems to suggest that global minima in ELS is somewhere around SF10% and much higher in both directions from this point. Global minima in ΔL is hard to tell, there seems to be two local minimas instead at the lowest and highest SFs each. The magnitude of estimated ELS also seems smaller than I expected compared against literature reported values. Fig. 10. Scatter and median value of bias magnitude between estimated Δy (COM) and VO reported by Stryd. Bias = [Δy (COM) - VO ]. Fig 11. Scatter and median value of bias between estimated ELS and Stryd reported LSS. Bias = ELS - LSS. Figs. 10 & 11 : The last two plots show the difference in Stryd's metrics of VO and LSS vs estimated Δy(COM) and ELS respectively. The bias in estimated Δy(COM) and VO each is lowest around SF-30% and SF-20% and progressively increases with increasing SF. At SF10% and beyond, there is an average of 0.1m of difference. The bias (or delta) in estimated ELS is approximately 5 KN/m less than Stryd's LSS between SF-20% and SF20%. At lower and higher SF's, the bias seems to get larger, with the highest bias of 10 kN/m at SF-30%. ELS was calulcated using a POFT relation to model change in leg length and maximum ground reaction force was modeled using temporal parameters such as duty factor (obtained from Styrd data) and body mass. I'm not able to fully justify the difference of 5kN/m between ELS and LSS, especially since ELS was estimated from Stryd's GCT and forward speed. The one possibility is that Stryd's algorithm for LSS uses half of leg swept angle in it's calculation of change in leg length. When this angle is introduced, change in leg length is smaller than that calculated from a simple spring model with POFT. Because change in leg length is smaller using the angle, for the same ground reaction force, estimated leg stiffness will be higher. Therefore, difference in applied models could very well explain the difference in obtained spring stiffnesses. Which model is "more correct" in leg stiffness calculation is a topic of debate. In the next installment Part 3, I'll be continuing to stick with leg spring characteristics but with a changes in running speed. I will also hope to compare treadmill running with outdoor running to see what real world conditions impose on the metrics. 1. The nature of the "curve" : Ground Reaction Force versus time during different step frequencies of running. Fast walking (or slow running) has two peaks corresponding to the lesser peak of heel touch and the greater peak before toe off. As running gets faster (and also in mid-foot or fore-foot based running), the curve F(t) assumes just one peak, making estimations of GRF easier with sinusoidal expressions which is essentially what researchers have done. 2. The planar spring mass model for running forwards : The shape of the vertical displacement, vertical force and horizontal force curves. 3. 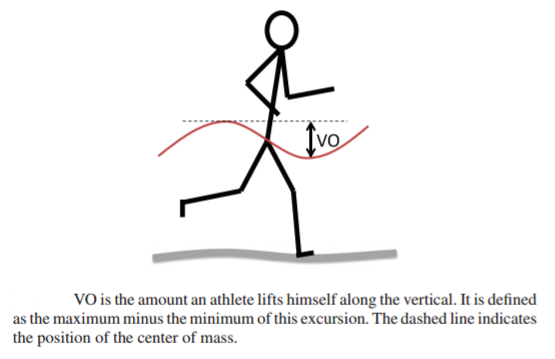 How vertical oscillation is defined : It is the total peak to peak displacement of the center of mass during the gait cycle, not to be confused with "change in vertical position of COM" which would only be a half of this peak to peak value. 4. How an accelerometer can detect ground contact time from acceleration signals. From Strohrmann et.al, IEEE 2012. 5. Consequences of POFT : The distance d of POFT as the anterioposterior difference in the position of the point of force application at ground contact and lift-off. This is due to real human running motion where individuals roll the feet from point of intial contact to toe off. This modifies the planar linear spring model as below. For the same peak vertical GRF, contact time and contact length, POFT d lowers the horizontal GRF and enables humans to do less external mechanical work per step. Also, with POFT accounted for, leg stiffness required to achieve certain running mechanics will increase as POFT increases. This would decrease leg shortening, and therefore reduce metabolic cost by reducing knee flexion. Without consideration of POFT, horizontal GRF and mechanical work can be overestimated. Duty Factor = Ground Contact Time / (Ground Contact Time + Flight Time). Lesser duty factors correspond to faster running but also higher peak vertical forces. It is not possible for humans to sustain high peak forces. This is the physics based reason why GCT cannot be decreased for human beings below a certain limit.